As an indispensable cosmetic, natual matte lipstick brings the best visual effect to our faces. Even though sometimes we don’t do the makeup, we will still apply our matte lipstick too. A red matte lipstick highlights a good complexion and attractive smile immeditaly, but only when you find the approprite one. How? Maybe you know that it should be based on your natural skin color. However, you may ignore the fact that different occasions, seasons and clothing colors need to be taken into consideration too. a. When you are about to attend an important dinner or feasts, leaving others a frivolous impression is kind of your goal. Then a classic red matte lipstick is perfect to make you look mature, avoid glossy color. b. Going for a job interview candidate, make sure you look serious and respectful. Pink matte lipstick series is natural and steady. c. A fresh color is appropriate for outdoor activities and the orange matte lipstick looks vivid, lively, which create a makeup style full of vigor. d. When it comes to a party night, choose a dazzling performance. Heavy color matte lipstick helps you to nail it. a.Saffron yellow, rose or coral liquid matte lipstick is quite harmonious with natural scenes in Spring. b.Light pink natural matte lipsticks are the best to show a sense of vitality in summer. c. In Autumn, an orange matte lipstick show off your nice feminine soft skin. d. Make-up should be clear and sharp in winter. 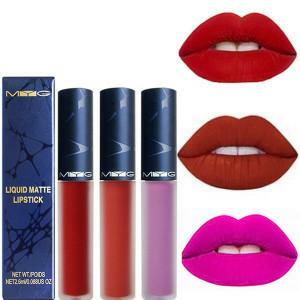 So dark cool colored best matte lipstick shades create a 3D visual effect. a. Black: facial make-up requires much thinking for black outfits. 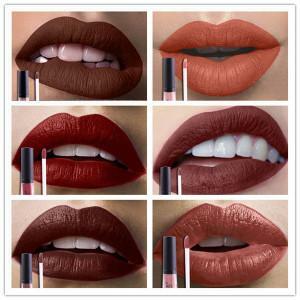 It is better to choose natural red matte lipstick, which brings a luxuriant and mature effect. b. White: a clear matte lip gloss makes your looks more sedate in white clothing. A pink natural lipstick seems elegant, rich with some youthful flavor. c. Red: red clothing should match with the same color liquid matte lipstick, or pink, or the look might seem uncoordinated.